Charles Augustus Lindbergh (February 4, 1902 – August 26, 1974) was a pioneering United States aviator famous for piloting the first solo non-stop flight across the Atlantic Ocean in 1927. Lindbergh was born in Detroit, Michigan, the son of Swedish immigrants. He grew up in Little Falls, Minnesota. 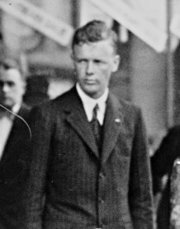 His father, Charles August Lindbergh, was a lawyer and later a U.S. congressman who opposed the entry of the U.S. into World War I; his mother was a chemistry teacher. Early on he showed an interest in machines. In 1922 he quit a mechanical engineering program, joined a pilot and mechanist training with Nebraska Aircraft, bought his own airplane, a Curtiss JN-4 "Jenny", and became a stunt pilot. In 1924, he started training as a U.S. military aviator with the United States Army Air Corps. After finishing first in his class, he worked as a civilian airmail pilot on the line St. Louis in the 1920s. In April 1923, while visiting friends in Lake Village, Arkansas, Lindbergh made his first ever night-time flight over Lake Village and Lake Chicot. Lindbergh gained sudden great international fame as the first pilot to fly solo and non-stop across the Atlantic Ocean, flying from Roosevelt Airfield (Nassau County, Long Island), New York to Paris on May 20-May 21, 1927 in his single-engine airplane The Spirit of St. Louis which had been designed by Donald Hall and custom built by Ryan Airlines of San Diego, California. He needed 33.5 hours for the trip. (His grandson Erik Lindbergh repeated this trip 75 years later in 2002.) Although Lindbergh was the first to fly from New York to Paris nonstop, he was not the first to make a Transatlantic flight. That had been done first in stages by the crew of the NC-4 in May 1919, with the first non-stop flight made by Alcock and Brown in June 1919. Lindbergh's accomplishment won him the Orteig Prize of $25,000 on offer since 1919. A ticker-tape parade was held for him down 5th Avenue in New York City on June 13, 1927. His public stature following this flight was such that he became an important voice on behalf of aviation activities until his death. He served on a variety of national and international boards and committees, including the central committee of the National Advisory Committee for Aeronautics in the United States. On March 21, 1929 he was presented the Medal of Honor for his historic trans-Atlantic flight. Lindbergh is recognized in aviation for demonstrating and charting polar air-routes, high altitude flying techniques, and increasing aircraft flying range by decreasing fuel consumption. These innovations are the basis of modern intercontinental air travel. He married Anne Morrow Lindbergh, an author, in 1929. He taught her how to fly and did much of the exploring and charting of air-routes together with her. The two had six children: Charles Augustus, Jr.(born 1930), Jon (1932), Land (1937), Anne (1940), Scott (1942) and Reeve (1945). Their son Charles Augustus, 20 months old, was abducted on March 1, 1932 from their home. The boy was found dead on May 12 in Hopewell, New Jersey just a few miles from the Lindbergh's home, after a nation-wide ten week search and ransom negotiations with the kidnappers. More than three years later, a media circus ensued when the man accused of the murder, Bruno Hauptmann, went on trial. Tired of being in the spotlight and still mourning the loss of their son, the Lindberghs moved to Europe in December 1935. Hauptmann, who maintained his innocence until the end, was found guilty and was executed on April 3, 1936. In Europe during the rise of fascism, Lindbergh traveled to Germany several times at the behest of the U.S. military, where he reported on German aviation and the Luftwaffe (air force). Lindbergh was intrigued, and stated that Germany had taken a leading part in a number of aviation developments, including metal construction, low-wing designs, dirigibles, and Diesel engines. Lindbergh also undertook a survey of aviation in the Soviet Union in 1938. The Lindberghs lived in England and Brittany, France during the late 1930's in order to find tranquility and avoid the celebrity that followed them everywhere in the United States after the kidnapping trial. In 1938 the American ambassador to Germany, Hugh Wilson invited Lindbergh to a dinner with Hermann Göring at the American embassy in Berlin. The dinner included diplomats and three of the greatest minds of German aviation, Ernst Heinkel, Adolf Baeumaker, and Dr. Willy Messerschmitt. Göring decorated Lindbergh with German medal of honor (the Verdienstkreuz Deutscher Adler) for his services to aviation and particularly for his 1927 flight. Lindbergh's decoration later caused an outcry in the United States, when Lindbergh's closeness to the Nazis was criticized. Lindbergh's letters and diaries of the time indicate that he approved of Nazi policies and of Hitler's leadership. Lindbergh declined to return the medal to the Germans because he claimed that to do so would be "an unnecessary insult" to the Nazi leadership. He would return to the United States as war broke out in Europe. As Nazi Germany began World War II, the Republican Lindbergh became a prominent speaker in favor of isolationism and pro-German policies, going so far as to recommend that the United States negotiate a neutrality pact with Germany during his January 23, 1941 testimony before Congress. Lindbergh was also the major spokesman for America First providing many speeches during 1940-1941. Lindbergh stated he would publicly name "the groups that were most powerful and effective in pushing the United States towards involvement in the war". At an America First rally in Des Moines, Iowa, on September 11, 1941, he made an infamous speech titled: "Who Are the War Agitators?". In it, he claimed that Americans had solidly opposed entering the war when it began, and that three groups had been "pressing this country toward war" -- the Roosevelt Administration, the British, and the Jews, and complained about what he insisted was the Jews' "large ownership and influence in our motion pictures, our press, our radio and our government." In the same speech, Lindbergh clearly communicated that he considered Jewish-Americans to not be patriotic when he said; "But I am saying that the leaders of both the British and Jewish races, for reasons which are understandable from their viewpoint as they are inadvisable from ours, for reasons which are not American, wish to involve us in the war. We cannot blame them for looking out for what they believe to be their own interests, but we also must look out for ours. We cannot allow the natural passions and prejudices of other people to lead our country to destruction." He also made an implicit threat against them, stating: "Instead of agitating for war, the Jewish groups in this country should be opposing it in every possible way for they will be among the first to feel its consequences. Tolerance is a virtue that depends upon peace and strength. History shows that it cannot survive war and devastation." Lindbergh resigned his commission in the U.S. Army Air Corps when President Franklin D. Roosevelt openly questioned his loyalty. After the attack on Pearl Harbor in 1941, Lindbergh attempted to return to the Army Air Corps, but was denied when several of Roosevelt's cabinet secretaries registered objections. He went on to assist with the war effort by serving as a civilian consultant to aviation companies and the government, as well as flying about 50 combat missions (again as a civilian) in 1944 in the Pacific. His contributions include engine-leaning techniques that Lindbergh showed P-38 Lightning pilots. This improved fuel usage in cruise, and enabled aircraft to fly longer range missions such as the one that killed Admiral Yamamoto. He also showed Marine F4U pilots how to take off with twice the bomb load that the aircraft was rated for. After World War II he lived quietly in Connecticut as a consultant both to the chief of staff of the U.S. Air Force and to Pan American World Airways. His 1953 book The Spirit of St. Louis, recounting his non-stop transatlantic flight, won the Pulitzer Prize in 1954. Dwight D. Eisenhower restored his assignment with the Army Air Corps and making him Brigadier General in 1954. In the 1960s, he became a spokesman for the conservation of the natural world, speaking in favor of the protection of whales, against super-sonic transport planes and was instrumental in establishing protections for the primitive Filipino group the Tasaday. From 1957 until his death in 1974, Lindbergh had an affair with a woman 24 years his junior, the German hat maker Brigitte Hesshaimer. They had three children together: Dyrk (born 1958), Astrid (born 1960), and David (born 1967). The two managed to keep the affair completely secret; even the children did not know the true identity of their father, whom they met sporadically when he came to visit. Astrid later read a magazine article about Lindbergh and found snapshots and more than a hundred letters written from him to her mother. She disclosed the affair in 2003, two years after both Brigitte Hesshaimer and Anne Morrow Lindbergh had died. DNA tests have confirmed the truth of these assertions. Besides, Lindbergh had sexual relationships with Brigitte Hesshaimer’s sister Marietta (with two children, Vago, born 1962, and Christoph, born 1966) and with his private secretary Valeska (again with two children, a son, born 1959, and a daughter, born 1961). So Lindbergh had in all seven children out of wedlock, a fact that has been connected with his statement after the murder of his son, "that there will still be many Lindberghs". Indeed, many believe that the tragic kidnapping and death of his son Charles Augustus psychologically influenced him to foster these children in secret so as to compensate for his terrible loss. Lindbergh spent his final years on the Hawaiian island of Maui, where he died of cancer on August 26, 1974. He was buried on the grounds of the Palapala Ho'omau Church in Hana Maui. His epitaph, which quotes Psalms 139:9, reads: Charles A. Lindbergh Born: Michigan, 1902. Died: Maui, 1974. If I take the wings of the morning, and dwell in the uttermost parts of the sea. The Lindbergh Terminal at Minneapolis-Saint Paul International Airport was named after him and a replica of The Spirit of St. Louis hangs there. He also lent his name to San Diego's Lindbergh Field, which is also known now as San Diego International Airport. The airport in Winslow Arizona has been renamed Winslow-Lindbergh Regional. Lindbergh himself had designed the airport in 1929 when it was built as a refueling point for the first coast to coast air service. The airport in Little Falls Minnesota where he grew up has been named Little Falls/Morrison County-Lindbergh Field. In 1952, Grandview High School in St. Louis County was renamed Lindbergh High School. The school newspaper is the Pilot, the yearbook is the Spirit, and the students are known as the Flyers. The school district was also later named after Lindbergh. A fictional version of Lindbergh is a major character in Philip Roth's 2004 counterfactual alternative history novel, The Plot Against America. In Roth's narrative, Lindbergh successfully runs against Roosevelt in the 1940 US presidential election, and aligns his country with the Nazis. This portrayal engendered considerable controversy. Another alternative history novel Robert Harris' Fatherland published in 1992 has Lindbergh as the American Ambassador in 1964 Nazi Germany. The Agatha Christie book and movie Murder on the Orient Express begin with a fictionalized depiction of the Lindbergh baby kidnapping. James Stewart played Lindbergh in the biographical The Spirit of St. Louis, directed by Billy Wilder. The film begins with events leading up to the flight before giving a gripping and intense view of the flight itself. Shortly after Lindbergh made his famous flight, the Stratemeyer Syndicate began publishing the Ted Scott Flying Stories by Franklin W. Dixon wherein the hero was closely modeled after Lindbergh.